Vegetable cheese balls recipe with easy step by step instructions for yiur easy understanding and learning. 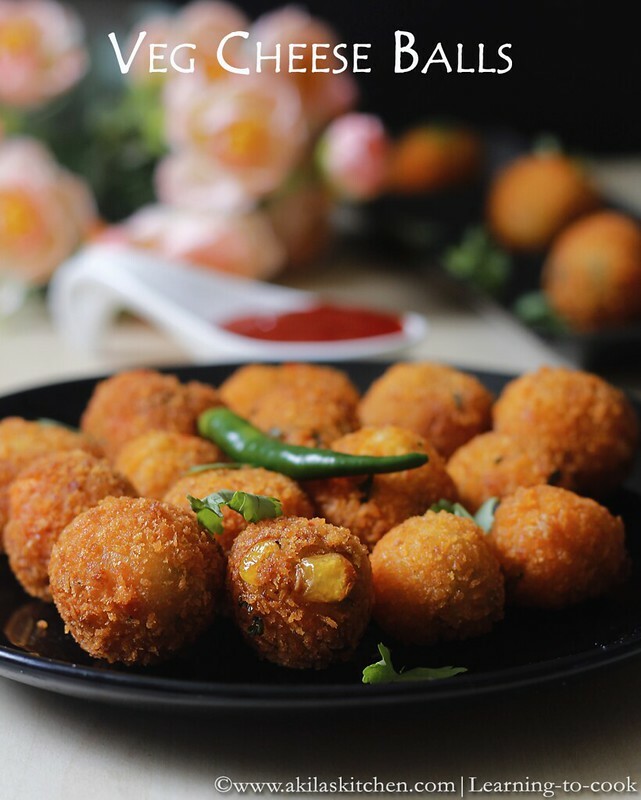 Veg cheese balls or vegetable cheese balls or veggie cheese balls is such a tempting snack that kids would love to have it. When I tried these and gave to my kids they finished it fast and asked some more and again I did another batch for myself and my hubby. These can be done for any parties or for guests and I assure you, you will get praised for these. I got the idea from here but changed to my taste. Need to try the original version also. Let’s see how to prepare these vegetable cheese balls or veg cheese balls. 1. 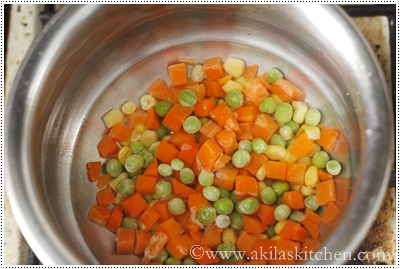 Cook the mixed veggies with little salt until soft. Boil the potatoes and peel off its skin. 2. If you are adding frozen paneer, Soak it in hot water for 3 min, squeeze slightly and then add it. If you are using fresh paneer just add as it is. Add the cheese. Mozzarella cheese does good work. 3. Chop the green chillies and coriander leaves finely and add it. 4. Add the required salt, all purpose flour, baking soda and mix well by crushing the vegetables and other ingredients as far as you can. Make a dough has shown below. 5. Make small equal balls and dip the balls in the milk. Immediately roll the balls in the breadcrumbs. 6. Again slightly dip the balls in the milk and roll the balls in the bread crumps mixture again until the bread crumps are coated well. Do the same for all the balls. Let it rest for 10 to 15 min in fridge. Now Heat the oil in medium and drop the balls slowly. 7. 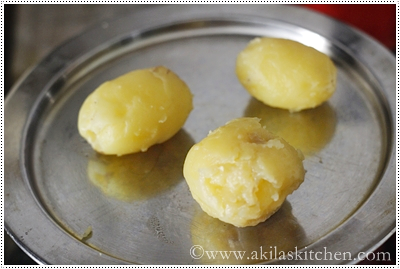 When the balls turns golden colour or light brown colour, remove it and filter the oil. Do this process in small batches. 8. 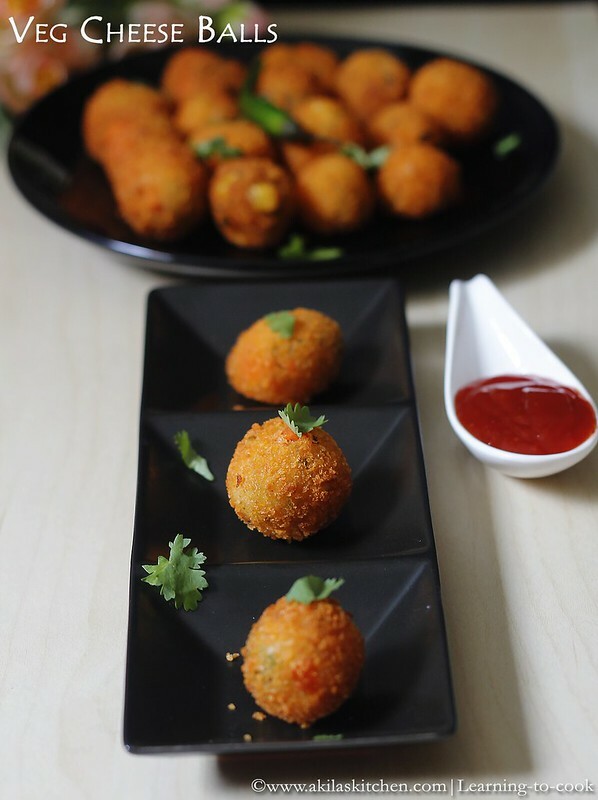 Yummy and addictive veg cheese balls are ready. Serve with tomato sauce or chilli sauce. 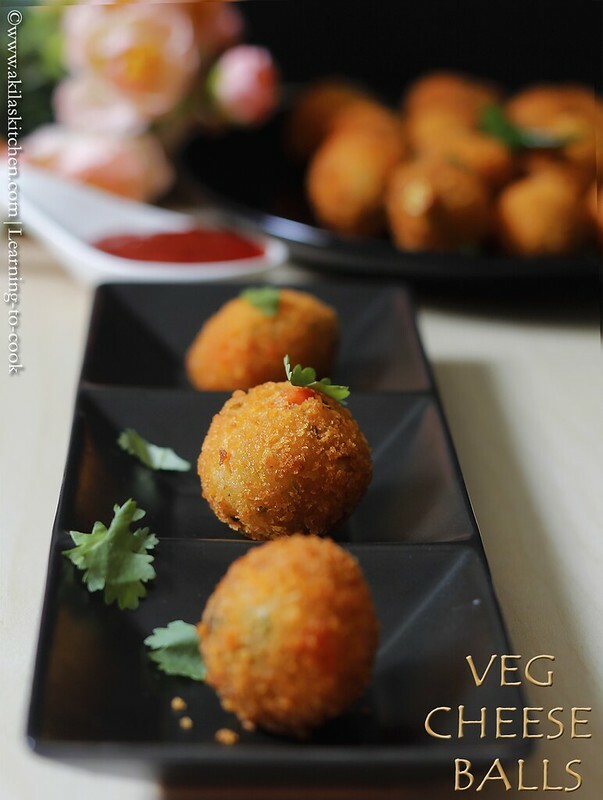 Veg cheese balls or vegetable cheese balls or veggi cheese balls is such a tempting snack that kids would love to have it. Cook the mixed veggies with little salt until soft. Boil the potatoes and peel off its skin. If you are adding frozen paneer, Soak it in hot water for 3 min, squeeze slightly and then add it. If you are using fresh paneer just add as it is. Add the cheese. Mozzarella cheese does good work. Chop the green chillies and coriander leaves finely and add it. Add the required salt, all purpose flour, baking soda and mix well by crushing the vegetables and other ingredients as far as you can. Make a dough has shown below. Make small equal balls and dip the balls in the milk. Immediately roll the balls in the breadcrumbs. Again slightly dip the balls in the milk and roll the balls in the bread crumps mixture again until the bread crumps are coated well. Do the same for all the balls. Let it rest for 10 to 15 min in fridge. Now Heat the oil in medium and drop the balls slowly. When the balls turns golden colour or light brown colour, remove it and filter the oil. Do this process in small batches. 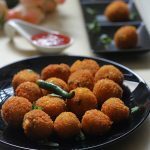 Yummy and addictive veg cheese balls are ready. Serve with tomato sauce or chilli sauce. Hi Prachi, I have not tried this with baking dear. So I am unable to answer it. Sorry dear. love it.. love it.. and love it… cant say anything else! Certainly some awesome shots there! Yummi-licious! Its soooo Tempting…wanna grab this from pics…. Gosh!! simply oozing with taste and that crispy coating on top? love it. 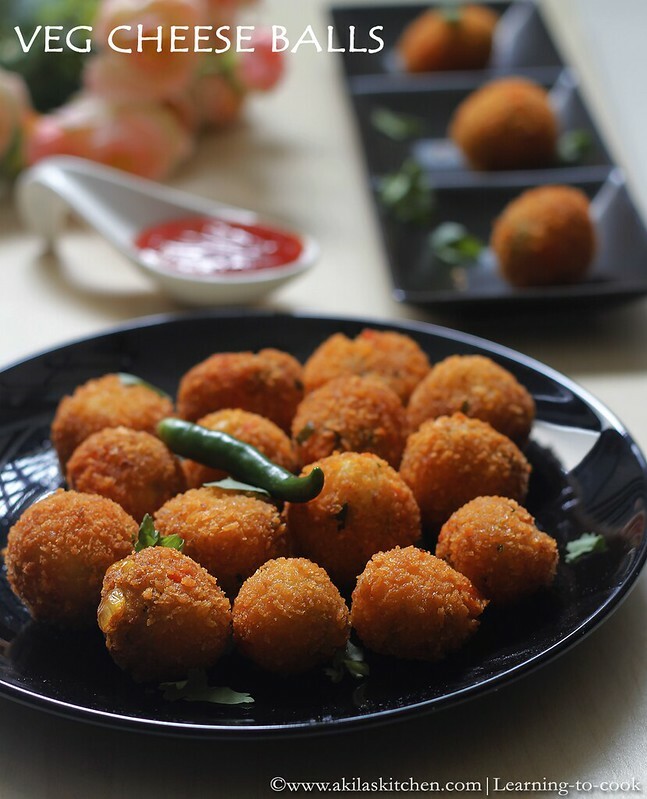 tis makes me completely drool..
wow these cheese balls luks beautiful…. wow! what an inviting presentation. Loved the cheese ball recipe. going to give it a try. I wonder how they looked on the inside post-frying. Super crispy balls, prefect for starter, i dont mind munch a plate full of.